Why literally? Because this device not only dispenses your beer but keeps it cool. I have used the mini-kegs (without any real special functions except dispensing), and it worked great for the little get together. It was a lot of fun getting the beer from the tap and there were no cans or bottles to deal with. 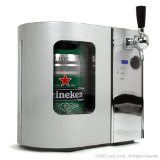 This extends that functionality and offers the beer drinker a nice alternative to the full sized kegerator.